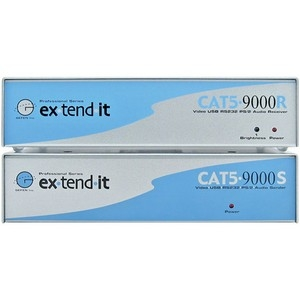 The extendit CAT5-9000 by Gefen allows users the benefits of extending VGA, USB, RS232, and audio signals beyond the desktop. In a growing number of applications, broadcast stations and production facilities there is a need to locate a computer remotely from the keyboard, mouse, and video monitor. A CPU may need to be shared between several users, for example, or moved to another room because of annoying fan noise.